"Eat like a peasant, Live like Royalty"
"Healthy eating is too expensive". I've heard that so many times and yes with some choices it can be. But it doesn't have to be. Shopping at "Whole Foods" used to be known as "Whole Paycheck". Yes they have high quality and hard to find products, but you will pay the price. Their "365 Everyday Value Brand" is the way to go. Both organic and natural products are available and the price is hard to beat. Most of us don't have a store near us, myself included, but when I am near one... you can bet I will be walking those aisles. If you have a "Trader Joes" near you, you can find many great choices to choose from at a low price. We have a statewide distribution center ten miles from our house! But the nearest retail store is forty miles away ! Crazy! You can find everything you need to eat healthy and at a reasonable price at your local grocery store and even Walmart. Walmart has been "talking" with Whole Foods on how they can provide healthy organic foods for their customers. They now carry a wide assortment of organic products and even carry "Beyond Meat" and "Hampton Creek" products. Both of these companies are bringing cutting edge technology from the "plant-based" food industry into mainstream market. You can "eat like a peasant" by buying nutrient dense foods and not buying "crap". This is just a suggestion on what to purchase, we need to eat a variety of different foods. And remember this only for a week, so fresh produce won't go bad. You can make many different meals with theses combinations. 1-28 oz. Trader Joe's Tuscano Marinara Sauce. A handful of fresh basil leaves(10-12). Divide mixture in half. Blend half in a high speed blender(Vitamix) along with the raw cashews (this is what will make the soup very creamy) until smooth. Return to saucepan and blend the remaining half in blender. Return to saucepan and keep warm until ready to serve. Chiffonade the fresh basil and sprinkle on top of soup. Use your day old hard French bread or baguettes to make delicious croutons! just cut them into bite size cubes, toss with olive oil and garlic salt. Bake at 350' until brown, approximately 10 minutes flipping once or twice. 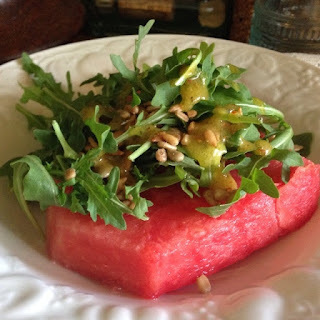 Since tomorrow is 4th of July, here's a recipe posted last year for "Watermelon Steak"